Adam Hart-Davis photographer, writer, broadcaster, a man passionate about his subjects. One of those subjects is James Watt. 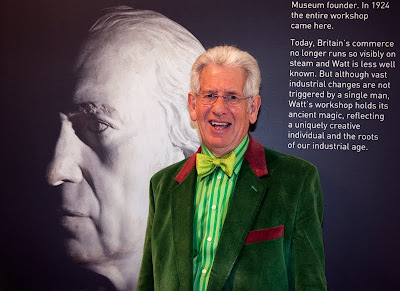 Yesterday Adam shared his passion at the opening of the "James Watt and Our World" exhibition at the Science Museum. Watt through his invention of the condenser (amongst many things), was a huge driving force in the industrial revolution which changed our world forever. Tomorrow I will show you more about James Watt and this exciting exhibition. I was listening to an item about this exhibition yesterday. It sounds fascinating. Watt was a multi-talented man. He looks very happy at work! I'll be back tomorrow to see more. Interesting post. I had not even heard of him. Not that's an outfit to set him out from the crowd! I'm GREEN with envy! He looks like a cross between an old-time ringmaster and Willy Wonka from the Chocolate Factory with that fancy gettup. To answer your question about the Mitre, not only do I stop for a drink I also have my "usual" for dinner. Good man Hart-Davis, even if a little bonkers. James Watt quite something himself. Was Watt responsible for the amp and the watt then?